We can provide various style and colors for you,if the order is large enough. Your satisfaction is our final target! 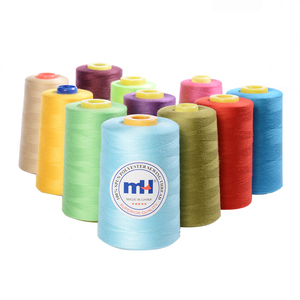 Base company Hubei Huaxin Textile Co.
Tongxiang Hengyu Textile Co., Ltd.
100% Spun polyester sewing thread is a kind of very commom sewing thread. Industry sewing have high quality requirements in strength, knot, and low hairiness. we chose different thickness of sewing thread according to the thickness of the garments and textile goods. two or more plies are then twisted together to produce a thread of the desired size. spun polyester thread made by spinning together lengths of polyester staple into single bundles called plies. our yarn and sewing thread has been export to brazil, bolivia, ecuador, peru, america, greece, thailand and etc . so it's also welcome to choose our odm products. Ningbo Tianyi Textile Thread Co., Ltd.
application trousers, coats, suits, shirts, etc. If any quality problem , we will bear all the responsibilities. We can offer you good quality products stably and quick delivery. We have own factory who can offer excellent quality products at a very competitive price. this thread is suitable for fabrics with stretch in them and is especially good for woven synthetics, knits and stretch fabrics. the appearance of this thread will be waxy or shiny, not matte like plain cotton. look forward to cooperate with your esteemed company! 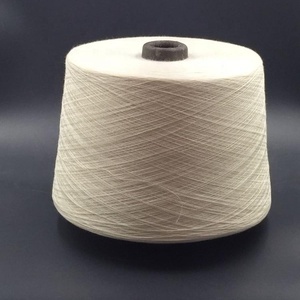 Facotry price yizheng fiber spun polyester sewing thread 100% Polyester sewing thread Chinese Supplier: Hubei Bingdong Trading Co., Ltd. , Ltd is the leading manufacturer of 100% spun polyester yarn and sewing thread in Hubei province, China. , Ltd has committed to producing high-qualified polyester spun yarn and sewing thread for more than 10 years. all the products use the best material-yizheng brand polyester stable fiber and has been tested before loading to the port,we can assure best and stable quality all the time. rich experienced workers and advanced imported machine for production. Jiangsu Bai Fusheng Textile Co., Ltd.
welcome to yangzhou longjang weaving factory we are professional and reliable manufacturer. it's my pleasure to service you . our yarn and sewing thread has been export to brazil, bolivia, ecuador, peru, america, greece, thailand and etc . weight and length per cone can be made customized, e.g. Ningbo S. Derons Import & Export Co., Ltd.
suitable for high-speed sewing of out-wear, underwear, top grade knitting apparel. after lubrication, the polyester thread reduces the coefficient of friction considerably. even when using high speed industry sewing machines, further properties such as poor rubbing and low tendency to curling have been judged as good in practice. 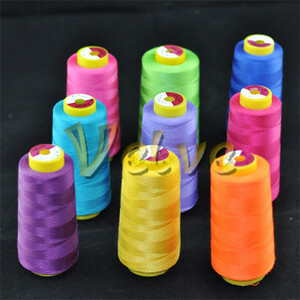 100% spun polyester sewing thread,polyester sewing thread,sewing thread A. 5. Plastic cone sewing thread is looser than the paper cone sewing thread; this makes the sewing thread more susceptible to dye. 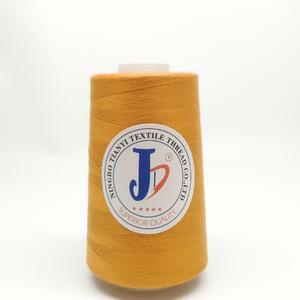 3.As per customer's requirements to packing Spun Polyester Sewing Thread Specification and Usages: specification regural length main usages 29.5*2 (20s/2) 3000M, 5000M,10000M Jeans, shoes, caps, leather products. Oct ASD & AMD Las Vegas Tokyo Gift Show Cologn Fairs Main export areas: Western European North American Germany Oceania Canada France Spain USA UK Welcome to our company! Zhejiang Dongzheng Craft Products Co. ,Ltd The offer is subject to our final confirmation. 29.5*3 (20s/3) 2000M, 3000M Jeans, shoes, handbags, leather products, etc. 9.8*3 (60s/3) 3000M, 5000M Knitted garments, fashionable dress, suit-dress, etc. 30s/2 3000Y,5000Y Jeans, handbags, sewing of keyhole and fastener, etc. Yiwu Yingming Thread Co., Ltd.
29.5*3 (20s/3) 2000M , 3000M Jeans, shoes, handbags, leather products, etc. 19.7*3 (30s/3) 2000M , 3000M, 5000M Tents jeans, leather products, shoes, ect. 11.8*2 (50s/2) 3000M , 5000M Knitted garments, blouses, suit-dress, etc. 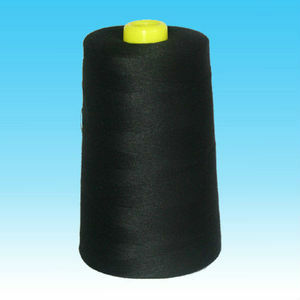 Alibaba.com offers 25,710 100% spun polyester sewing thread products. About 33% of these are thread, 30% are 100% polyester yarn, and 26% are sewing threads. 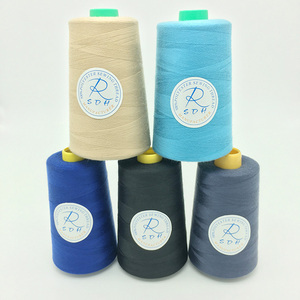 A wide variety of 100% spun polyester sewing thread options are available to you, such as high tenacity, chemical resistance, and low shrinkage. You can also choose from 100% polyester, 100% cotton, and 100% polypropylene. As well as from raw white, raw, and dyed. And whether 100% spun polyester sewing thread is free samples, or paid samples. 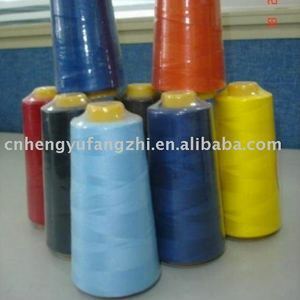 There are 25,534 100% spun polyester sewing thread suppliers, mainly located in Asia. 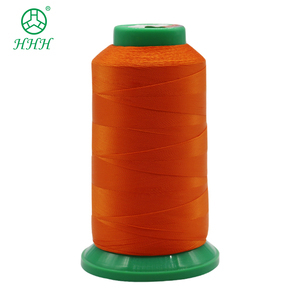 The top supplying countries are China (Mainland), Vietnam, and India, which supply 98%, 1%, and 1% of 100% spun polyester sewing thread respectively. 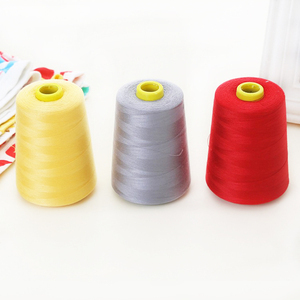 00% spun polyester sewing thread products are most popular in Mid East, South America, and Southeast Asia. You can ensure product safety by selecting from certified suppliers, including 8,742 with Other, 3,116 with ISO9001, and 655 with BRC certification.